DeAngelo Chondon Williams (born April 25, 1983) is a former American football running back. He played college football at Memphis, and was drafted by the Carolina Panthers in the first round of the 2006 NFL Draft. He starred in a dual role in Carolina alongside Jonathan Stewart, until Williams' release in the 2014 offseason. He then played for the Pittsburgh Steelers from 2015 to 2016. Williams was considered the top running back in the state of Arkansas in 2001, having played at Wynne High School in Wynne, Arkansas. He missed most of his sophomore season with a broken bone in his foot. As a junior, he gained 1,044 yards rushing and scored 14 touchdowns, leading him to be named to the Arkansas All-State team in 2000. As a senior, he rushed for a single-season record 2,204 yards and 34 touchdowns, averaging 10.4 yards per carry while leading his squad to the state 4A championship. He had 939 yards rushing in four playoff games, including 26 carries for 302 yards and six touchdowns against Greenwood; in the state championship game against Stuttgart, he rushed for 194 yards on 24 attempts, scoring two rushing touchdowns, one receiving touchdown and one return touchdown. He was named the Arkansas Democrat-Gazette 2001 Offensive Player of the Year and was selected to the Associated Press Arkansas Super Team in 2001. Williams was a letterman in track & field. He still holds the state 4A record in the 100-meter dash with an electronically-timed 10.81 seconds. He helped lead Wynne to a second-place finish in the 2001 state track championships. Williams was rated as the 25th best running back prospect in the nation, the number two overall prospect in the state of Arkansas and was named to the All-America and All-Region Team by SuperPrep. He was recruited by Ole Miss, Arkansas, and Iowa before deciding on Memphis. Williams attended the University of Memphis, where he played for the Memphis Tigers football team. He holds the Division I National Collegiate Athletic Association (NCAA) record for 100-yard rushing games (34) and All-purpose yards (7,573). He also ranks sixth on the all-time NCAA rushing list with 6,026 yards. Williams was named to the 2004 Pro Football Weekly All-America Team. Entering Memphis, Williams was a highly touted signee. He played in 10 games as a true freshman. In his first career game against Murray State, he racked up 129 rushing yards, on 12 rushes, and a touchdown, marking the second most rushing yards in school history by a true freshman. Against Tulane, he gained 166 rushing yards, including an 86-yard touchdown. For his performance in the Tulane game, he received the Conference USA Player of the Week. While playing Louisville, he suffered a knee sprain and was forced to sit out the next week's contest against Mississippi State. He had a career-high two rushing touchdowns against Army, as well as 10 carries and 110 rushing yards. He led the team with 684 rushing yards, 103 carries and five rushing touchdowns. In the 2003 regular season opener against Tennessee Tech, Williams had 61 rushing yards and one rushing touchdown. He had career highs of 135 receiving yards and two receiving touchdowns playing against the Golden Eagles. The following week against Mississippi, he recorded 131 rushing yards, 36 receiving yards, and two rushing touchdowns. He gained over 100 yards the following week against Southern Mississippi, finishing the game with 158 rushing yards. After a 108-yard game against Arkansas State and another 107-yard game against UAB the following week, he tied the school record with four consecutive +100 yard games in a row. The game after, he broke the record, when he posted 119 rushing yards against Mississippi State. He continued the streak against the Houston Cougars with 120 rushing yards and 2 touchdowns. The next week he had a career-high, 195 rushing yards and 2 touchdowns, in the victory against Tulane. Playing East Carolina, he made the record eight consecutive games with over +100 rushing yards. With the 137 yards rushing, he broke the school record for single season rushing yards. He continued to break records the next week, when he broke the school record for attempts in a single season. William's had 154 rushing yards, 1 rushing touchdown on 27 attempts against Louisville. The next week, in a win against Cincinnati, he posted 136 rushing yards but tore his MCL during the game, ending his record-breaking season. He ended the season with over 1,400 rushing yards, the most in school history, and leading the nation in all-purpose yards. He was named as the 2003 Conference USA Offensive Player of the Year. After missing the last two regular season games and the New Orleans Bowl, Williams returned in the 2004 season opener against Mississippi. With 118 rushing yards, he made it 11 consecutive games with over 100 rushing yards, continuing the streak he began in 2004, and having a career-high 37 attempts. While playing against Chattanooga, Williams gained 136 rushing yards, three rushing touchdowns, 87 receiving yards, and a touchdown reception. His four touchdowns marked a career-high for a single game. His streak ended a few weeks later, at 13 when UAB held him to 92 rushing yards. Williams' junior season ended when he broke his leg while playing Bowling Green. He finished his junior year leading the nation with 22 rushing touchdowns and second with 1,948 rushing yards. For the second straight year, he was named as the Conference USA Offensive Player of the Year. Williams started his senior season being held to 85 rushing yards against Ole Miss but followed that up with ten consecutive games with over 100 yards rushing. While playing against Chattanooga, he rushed for 205 yards. He rushed for over 200 yards when he finished with 223 yards against Tulsa. The next week, he posted 236 rushing yards playing against UTEP. After a few games, Williams accumulated 226 rushing yards and two touchdowns against East Carolina. He finished the regular season with 127 rushing yards against Marshall. In his final college game, the 2005 Motor City Bowl, Williams helped Memphis defeat the Akron Zips 38-31, by running for a Bowl record 238 yards and scoring three touchdowns. His performance made him the top ground-gainer in college football in 2005. Williams was also an All-America selection by the American Football Coaches Association (AFCA) and the Walter Camp Foundation. Williams was a finalist for the 2005 Doak Walker Award, which was awarded to Reggie Bush. He came in seventh overall in the Heisman Trophy voting. In 2005, Williams was named the inaugural winner of the ARA Sportsmanship Award, presented by the Awards and Recognition Association to the Division I football player who best exhibits sportsmanship both on and off the field. For the third straight year, he was named as the Conference USA Offensive Player of the Year. In January, Williams attended the 2006 Senior Bowl in Mobile, Alabama, an annual event in which college seniors and professional prospects are evaluated by NFL personnel in preparation for the NFL Draft. His height was officially measured at 5'9, which led some scouts to question his potential as an undersized back in the NFL. However, scouting reports soon placed him among the most impressive performers during the practice week leading up to the Bowl, and Williams punctuated the week with a strong, if brief, showing in the game itself, rushing for 31 yards on 3 carries and catching 2 passes for 28 yards. For the NFL Combine, Williams trained at D1 Sports Training in Nashville, Tennessee. On March 24, at the Pro Day on the University of Memphis campus, Williams ostensibly improved his draft stock even further with an exceptional workout. He ran his 40-yard dash in 4.40 seconds with the wind and 4.48 seconds against the wind. He also impressed in the short shuttle, the three-cone drill, and the long shuttle. In addition, he recorded a 34½-inch vertical jump and a 10-foot-9 broad jump and caught the ball well in receiving drills. Though at one point he was considered a top ten pick, with some projecting him as high as #4 overall to the New York Jets, Williams saw his draft stock fall in weeks preceding the draft, as many teams filled their needs at the running back position via free agency. On April 29, 2006, he was selected by the Carolina Panthers in the first round with the 27th overall pick in the NFL Draft. He joined Reggie Bush, LenDale White, Laurence Maroney, and Joseph Addai, among others, in a promising draft class at running back. 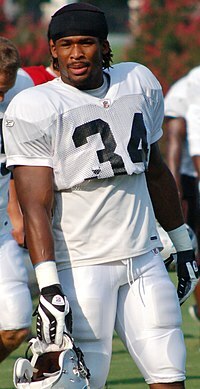 Williams adopted the jersey #34, which he wore in high school, and which was the same as his hero at the time, Ricky Williams. Williams played in the first five games of the 2006 season and looked promising as an alternative to DeShaun Foster in the Carolina backfield, compiling an impressive average of 5.3 yards per carry. He missed Weeks 6 through 8 with a sprained ankle. In Week 11 against the St. Louis Rams, Williams filled in for Foster, who had injured his elbow, and totaled 20 carries for 114 yards. In a Monday Night Football game against the Philadelphia Eagles, Williams started for an injured Foster and managed 74 rushing yards on 17 carries and an impressive 101 receiving yards on seven catches with a touchdown. He had 501 rushing yards and one touchdown on the year. In the 2007 season, Williams continued to back up DeShaun Foster. He had his first 100-yard game of the season in a win week six against the Arizona Cardinals. In the fourth quarter, he clinched the win with a 75-yard run, the longest in team history, only to be tackled short of the goal line. On the next play, he ran the ball to the right corner of endzone for his first touchdown of the season. The next five weeks, he had low numbers due to limited playing time. In the final week of the season, Williams rushed for 121 yards on 20 carries while scoring two touchdowns against the Tampa Bay Buccaneers. He finished the season with 144 carries for 717 yards and was ninth in the NFL in yards per carry (5.0). Williams established himself as the starting running back for the Panthers prior to the 2008 season. During the 2008 season, Williams shared carries with 2008 draft pick Jonathan Stewart, though Williams received a majority of the work. On November 30, 2008, Williams set a franchise record for rushing touchdowns in one game by scoring four touchdowns in a Week 13 game against the Green Bay Packers. In Week 14, Williams was selected FedEx Ground Player-of-the-Week after a dominating performance in which he rushed for 186 yards on 19 carries and 2 touchdowns against the Tampa Bay Buccaneers on Monday Night Football. He earned NFC Offensive Player of the Week honors for his effort against the Buccaneers. On December 21, 2008, in a game against the New York Giants for the number one playoff seed, Williams rushed for 108 yards and four touchdowns in an overtime loss. Williams did not fumble the entire 2008 season. Despite having a stellar season, he was unable to make the Pro Bowl over Clinton Portis, despite having more total yards, touchdowns, and yards per carry. This is mainly attributed to Portis outperforming Williams the first half of the season, as well as the large Redskins fanbase. Williams did, however, make the All-Pro team. He finished the 2008 season with 273 carries for 1,515 yards and 18 rushing touchdowns, to go along with 22 catches for 121 yards and 2 more touchdowns. Williams credited much of his 2008 success to a discussion with Vinny Testaverde and improved pre-game preparation. After the season, Williams was voted Pro Football Weekly and the Professional Football Writers of America's Most Improved Player of the Year. In week 7 of the 2009 NFL season, Williams broke a 77-yard run against the Cardinals, breaking his previous record of 75 yards, which was also set against Arizona. The Panthers got their revenge from the previous year's playoff loss as they beat the Cardinals 34-21. In a game against Tampa Bay, Williams had 152 rushing yards as he scored the game-winning touchdown in Carolina's 28-21 win. Despite missing all of 3 games and most of 2 more due to injury, Williams managed to rush for 1,117 yards and 7 touchdowns on 216 carries, as well as receiving for 252 yards on 29 catches, earning himself a spot in the Pro Bowl. He and Jonathan Stewart became the first running back duo in NFL History to rush for 1,110 yards apiece (with Stewart rushing for 1,133 yards), as well as becoming the first Panther running back to rush for 1,000 in consecutive seasons. During the 2010 Pro Bowl, Williams scored a touchdown on a 7-yard run, the first by a Panthers player in team history. He finished the game with 2 carries for 6 yards and a touchdown, as well as a 15-yard reception. Williams at ESPN The Weekend in February 2010. Williams injured his right foot during the Panthers' home win against the San Francisco 49ers on October 24, 2010. He did not play again before being placed on injured reserve on November 17, 2010, with what was announced to be a mid-foot sprain. Williams finished the year with 361 yards and one touchdown on 87 rushes, along with 61 yards and no touchdowns on 11 catches. On July 27, 2011, Williams signed a 5-year $43 million contract extension to stay with the Panthers. In 2011, the Panthers drafted Cam Newton as their starting quarterback. This resulted in a three way split for carries between Williams, Stewart, and Newton. Williams helped the trio finish third in the league in total rushing yards with 2,408. The Panthers finished first in average yards per carry and first in total touchdowns with 26. Williams finished the season with 836 rushing yards and seven touchdowns. In 2012, the Panthers signed former San Diego Chargers fullback Mike Tolbert. The signing meant that Williams's carries would yet again be split with Stewart, Newton, and newcomer Tolbert. In Week 17, against the New Orleans Saints, he rushed for a career-high 210 rushing yards and two rushing touchdowns. Although he played every game of the season, he only started 10 of the games. He recorded 737 yards on 173 attempts. He scored five rushing touchdowns and two on the receiving end. In 2013, Williams had his most rushing attempts (201) since his Pro Bowl season in 2009. However, he did not make much out of these carries, only rushing for 843 yards. He scored 3 rushing touchdowns, his fewest since his injury plagued season in 2010, and one receiving. Williams rushed for 72 yards on 12 attempts in the season opening victory over the Tampa Bay Buccaneers. He missed the second and third games of the season against the Detroit Lions and the Pittsburgh Steelers respectively, because of a hamstring injury that he suffered during a practice in between week one and two. In a Week 4 loss versus the Baltimore Ravens, Williams suffered a high ankle sprain and was taken out of the game. His cast was removed on October 6, 2014. Coach Ron Rivera has said that Williams would be able to return for week nine. In a Week 13 loss to the Minnesota Vikings, Williams fractured his right middle finger. He was listed as day to day. He missed a Week 14 victory over the New Orleans Saints due to his hand injury. He was listed as doubtful for the week fifteen game versus the Tampa Bay Buccaneers. After missing the final two games of the season versus the Cleveland Browns and the Atlanta Falcons respectively, Williams returned for the Wild Card Round versus the Arizona Cardinals. He saw very limited action, only carrying the ball four times for 16 yards and no receptions in a 27-16 victory. In the Divisional Round game versus the Seattle Seahawks, Williams carried the ball two times for 14 yards in a 31-17 loss. He was released on March 10, 2015. On March 13, 2015, Williams signed a two-year contract with the Pittsburgh Steelers. The contract was for 2 years and $4.0 million, with $1.13 million guaranteed, and a signing bonus of $1.13 million. Williams made his first career start as a Steeler on September 10 in the NFL season opener against the New England Patriots. In his debut, he ran for 127 yards on 21 carries, his most in a game since 2012. In Week 2, against the San Francisco 49ers, Williams scored 3 touchdowns on 20 carries for 77 yards. 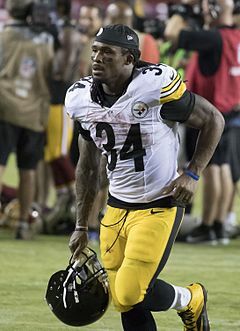 Despite his success in the first two weeks of the season, Williams was used as a back up once All-Pro starter Le'Veon Bell returned from his 2-game suspension. In Bell's first game back, Williams received only one carry for 2-yards in a week 3 victory over the St. Louis Rams. In a Week 4 loss against the Baltimore Ravens, Williams had only 2 rushing attempts for 5 yards. On October 28, Williams was fined $5,787 for wearing eye black that read "Find the Cure" in honor of breast cancer awareness. 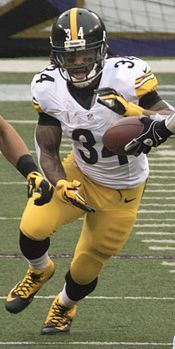 During a Week 8 loss to the Cincinnati Bengals, Williams rushed for 71 yards on 9 carries and came in the game for Le'Veon Bell, who left with an injury. It was reported that Bell had sustained a torn MCL and would miss the rest of the season, effectively making Williams the starting running back. In his first start since Week 2, Williams had a season-high 27 carries for 170 yards and scored two touchdowns, while accounting for 55 receiving yards on two receptions in a Week 9 victory over the Oakland Raiders. On December 13, 2015, he had 23 rushes for 76 yards and two rushing touchdowns in a win over the Cincinnati Bengals. Already without Bell, in Week 17 on the road against the Cleveland Browns, Williams suffered an ankle injury and did not return. This injury kept him out of the Steelers' 18-16 Wild Card Round victory over Cincinnati and the following week against the eventual Super Bowl champion Denver Broncos in the Divisional Round. Williams finished the 2015 regular season with 907 rushing yards and a league-leading 11 rushing touchdowns. Williams was again called upon to serve as the Steelers lead running back after another Le'Veon Bell suspension, this time for the first three games of the season. After two weeks in the 2016 season, he was the league leader in rushing yards after rushing for 146 yards against the Washington Redskins in the season opener and 94 yards on a career-high 32 carries against the Cincinnati Bengals in the next game. For his Week 1 performance, he earned AFC Offensive Player of the Week. His production dipped later on the season and he finished with 343 rushing yards and four rushing touchdowns. The Steelers made the playoffs and advanced to the AFC Championship. In the 36–17 loss to the New England Patriots, he had 14 carries for 34 rushing yards and a rushing touchdown to go along with seven receptions for 51 yards. In addition, he had a successful two-point conversion in what was his final professional game.. On June 25, 2018, he announced on Facebook that he had retired from the NFL. Williams appeared on the April 2, 2017, episode of Impact Wrestling, alongside former NFL tight end Gary Barnidge, to save Moose from an attack. A week later, Williams announced he would make his debut as a professional wrestler at an upcoming pay-per-view event. Williams stated "I'm a huge, huge, huge fan of professional wrestling, and everything I'm going to do in the ring will be for the wrestlers who I have watched in the past, as well as those I still watch today. I respect the sport, the wrestlers and everything that comes with it." in a press release hyping his appearance. Accompanied by Barnidge and Austin Dillon, Williams made his debut at Slammiversary XV on July 2, 2017, teaming with Moose (himself a former NFL player) in a victory over Chris Adonis and Eli Drake. His performance in the match received rave reviews from critics, including journalist Dave Meltzer, who stated that Williams "has the potential to be one of the greatest wrestlers I've ever seen", and compared him to other athletes turned wrestlers such as Matt Riddle, Akiyama, and Kurt Angle. Bryan Alvarez stated that Williams was "pretty damn amazing in his first-ever match". Meltzer later stated that Williams had the best in-ring performance by a celebrity in wrestling history. Williams announced his retirement from wrestling on July 5, 2017. On July 2, 2018, Williams announced he is returning to wrestling and will wrestle again for Impact. Williams was born on April 25, 1983 to his mother Sandra Hill. His mother was diagnosed with breast cancer in 2004. After ten years battling the illness, she died in May 2014. Four of his aunts have also had breast cancer. Williams now works with Susan G. Komen and has pink highlights in his dreadlocks to support the fight against breast cancer. ^ Sabin, Rainer (February 26, 2006). "A Delta Town in Arkansas Makes Williams Its No. 1 Pick". The New York Times. Retrieved March 31, 2018. ^ "DeAngelo Williams College Stats". College Football at Sports-Reference.com. Retrieved March 31, 2018. ^ "Rushing Yards Career Leaders and Records". College Football at Sports-Reference.com. Retrieved March 31, 2018. ^ "Murray State at Memphis Box Score, August 31, 2002". College Football at Sports-Reference.com. Retrieved March 31, 2018. ^ "Tulane at Memphis Box Score, September 21, 2002". College Football at Sports-Reference.com. Retrieved March 31, 2018. ^ "Army at Memphis Box Score, November 23, 2002". College Football at Sports-Reference.com. Retrieved March 31, 2018. ^ a b "Memphis Tigers Player Bio: DeAngelo Williams". Archived from the original on June 13, 2015. ^ "2002 Memphis Tigers Stats". College Football at Sports-Reference.com. Retrieved March 31, 2018. ^ "DeAngelo Williams 2002 Game Log". College Football at Sports-Reference.com. Retrieved March 31, 2018. ^ "Tennessee Tech at Memphis Box Score, August 30, 2003". College Football at Sports-Reference.com. Retrieved March 31, 2018. ^ "Ole Miss at Memphis Box Score, September 6, 2003". College Football at Sports-Reference.com. Retrieved March 31, 2018. ^ "Memphis at Southern Mississippi Box Score, September 13, 2003". College Football at Sports-Reference.com. Retrieved March 31, 2018. ^ "Arkansas State at Memphis Box Score, September 27, 2003". College Football at Sports-Reference.com. Retrieved March 31, 2018. ^ "UAB at Memphis Box Score, October 4, 2003". College Football at Sports-Reference.com. Retrieved March 31, 2018. ^ "Memphis at Mississippi State Box Score, October 11, 2003". College Football at Sports-Reference.com. Retrieved March 31, 2018. ^ "Memphis at Houston Box Score, October 18, 2003". College Football at Sports-Reference.com. Retrieved March 31, 2018. ^ "Memphis at Tulane Box Score, October 25, 2003". College Football at Sports-Reference.com. Retrieved March 31, 2018. ^ "East Carolina at Memphis Box Score, November 1, 2003". College Football at Sports-Reference.com. Retrieved March 31, 2018. ^ "Memphis at Louisville Box Score, November 15, 2003". College Football at Sports-Reference.com. Retrieved March 31, 2018. ^ "Cincinnati at Memphis Box Score, November 22, 2003". College Football at Sports-Reference.com. Retrieved March 31, 2018. ^ "DeAngelo Williams 2003 Game Log". College Football at Sports-Reference.com. Retrieved March 31, 2018. ^ a b c "CUSA Offensive Player of the Year Winners". College Football at Sports-Reference.com. Retrieved March 31, 2018. ^ "Memphis at Ole Miss Box Score, September 4, 2004". College Football at Sports-Reference.com. Retrieved March 31, 2018. ^ "Chattanooga at Memphis Box Score, September 11, 2004". College Football at Sports-Reference.com. Retrieved March 31, 2018. ^ "Memphis at UAB Box Score, September 25, 2004". College Football at Sports-Reference.com. Retrieved March 31, 2018. ^ "DeAngelo Williams 2004 Game Log". College Football at Sports-Reference.com. Retrieved March 31, 2018. ^ "Ole Miss at Memphis Box Score, September 5, 2005". College Football at Sports-Reference.com. Retrieved March 31, 2018. ^ "Chattanooga at Memphis Box Score, September 17, 2005". College Football at Sports-Reference.com. Retrieved March 31, 2018. ^ "Memphis at Tulsa Box Score, September 24, 2005". College Football at Sports-Reference.com. Retrieved March 31, 2018. ^ "UTEP at Memphis Box Score, October 1, 2005". College Football at Sports-Reference.com. Retrieved March 31, 2018. ^ "East Carolina at Memphis Box Score, October 22, 2005". College Football at Sports-Reference.com. Retrieved March 31, 2018. ^ "Marshall at Memphis Box Score, November 26, 2005". College Football at Sports-Reference.com. Retrieved March 31, 2018. ^ "Motor City Bowl - Memphis vs Akron Box Score, December 26, 2005". College Football at Sports-Reference.com. Retrieved March 31, 2018. ^ "2005 Heisman Trophy Voting". College Football at Sports-Reference.com. Retrieved March 31, 2018. ^ "DeAngelo Williams - Memphis, RB : 2006 NFL Draft Scout Player Profile". www.nfldraftscout.com. Retrieved July 4, 2017. ^ "2006 NFL Draft Listing". Pro-Football-Reference.com. Retrieved March 31, 2018. ^ DeArdo, Bryan (July 6, 2015). "DeAngelo Williams honors favorite childhood RB". Behind the Steel Curtain. Retrieved March 19, 2019. ^ "2006 Carolina Panthers Statistics & Players". Pro-Football-Reference.com. Retrieved March 31, 2018. ^ "St. Louis Rams at Carolina Panthers - November 19th, 2006". Pro-Football-Reference.com. Retrieved March 31, 2018. ^ "Carolina Panthers at Philadelphia Eagles - December 4th, 2006". Pro-Football-Reference.com. Retrieved March 31, 2018. ^ "DeAngelo Williams 2006 Game Log". Pro-Football-Reference.com. Retrieved March 31, 2018. ^ "2007 Carolina Panthers Statistics & Players". Pro-Football-Reference.com. Retrieved March 31, 2018. ^ "Carolina Panthers at Arizona Cardinals - October 14th, 2007". Pro-Football-Reference.com. Retrieved March 31, 2018. ^ "Carolina Panthers at Tampa Bay Buccaneers - December 30th, 2007". Pro-Football-Reference.com. Retrieved March 31, 2018. ^ "DeAngelo Williams 2007 Game Log". Pro-Football-Reference.com. Retrieved March 31, 2018. ^ "2007 NFL Leaders and Leaderboards". Pro-Football-Reference.com. Retrieved March 31, 2018. ^ "2008 Carolina Panthers Statistics & Players". Pro-Football-Reference.com. Retrieved March 31, 2018. ^ "Carolina Panthers at Green Bay Packers - November 30th, 2008". Pro-Football-Reference.com. Retrieved March 31, 2018. ^ "Tampa Bay Buccaneers at Carolina Panthers - December 8th, 2008". Pro-Football-Reference.com. Retrieved March 31, 2018. ^ "2008 NFL Week 14 Leaders & Scores". Pro-Football-Reference.com. Retrieved March 31, 2018. ^ "Carolina Panthers at New York Giants - December 21st, 2008". Pro-Football-Reference.com. Retrieved March 31, 2018. ^ "DeAngelo Williams 2008 Game Log". Pro-Football-Reference.com. Retrieved March 31, 2018. ^ "NFL football news, rumors, analysis". Pro Football Weekly. Retrieved July 4, 2017. ^ "Carolina Panthers at Arizona Cardinals - November 1st, 2009". Pro-Football-Reference.com. Retrieved March 31, 2018. ^ "Carolina Panthers at Tampa Bay Buccaneers - October 18th, 2009". Pro-Football-Reference.com. Retrieved March 31, 2018. ^ "2009 NFL Pro Bowlers". Pro-Football-Reference.com. Retrieved March 31, 2018. ^ "DeAngelo Williams 2009 Game Log". Pro-Football-Reference.com. Retrieved March 31, 2018. ^ "NFC Nationals vs. AFC Americans - Box Score - January 31, 2010". www.foxsports.com. Retrieved March 31, 2018. ^ AOL. "Sports News & latest headlines from AOL". AOL.com. Retrieved July 4, 2017. ^ "Season over for Panthers running back Williams". ESPN.com. November 17, 2010. Retrieved July 4, 2017. ^ "DeAngelo Williams 2010 Game Log". Pro-Football-Reference.com. Retrieved March 31, 2018. ^ "2011 NFL Draft Results and Analysis: Round 1 - National Football League - ESPN". ESPN.com. Retrieved July 4, 2017. ^ "2011 Carolina Panthers Statistics & Players". Pro-Football-Reference.com. Retrieved March 31, 2018. ^ "2011 NFL Team Rushing Stats - National Football League - ESPN". ESPN.com. Retrieved July 4, 2017. ^ "DeAngelo Williams". ESPN.com. Retrieved July 4, 2017. ^ "DeAngelo Williams 2011 Game Log". Pro-Football-Reference.com. Retrieved March 31, 2018. ^ "2012 Carolina Panthers Statistics & Players". Pro-Football-Reference.com. Retrieved March 31, 2018. ^ "Carolina Panthers at New Orleans Saints - December 30th, 2012". Pro-Football-Reference.com. Retrieved March 19, 2019. ^ "DeAngelo Williams 2012 Game Log". Pro-Football-Reference.com. Retrieved March 31, 2018. ^ "DeAngelo Williams: Career Stats at NFL.com". www.nfl.com. Retrieved July 4, 2017. ^ "Carolina Panthers at Tampa Bay Buccaneers - September 7th, 2014". Pro-Football-Reference.com. Retrieved March 31, 2018. ^ "No DeAngelo Williams for Panthers tonight". Retrieved July 4, 2017. ^ "Josh Norman being tested for concussion; DeAngelo Williams' cast removed". Retrieved July 4, 2017. ^ "Panthers' Williams 'ready to roll' after injury". Retrieved July 4, 2017. ^ "DeAngelo Williams "ready to roll"". Retrieved July 4, 2017. ^ "Panthers' Williams has broken bone in hand". Retrieved July 4, 2017. ^ "Panthers confirm DeAngelo Williams suffered broken finger". Retrieved July 4, 2017. ^ "DeAngelo Williams out this week, but Greg Olsen's OK". Retrieved July 4, 2017. ^ "Wild Card - Arizona Cardinals at Carolina Panthers - January 3rd, 2015". Pro-Football-Reference.com. Retrieved March 31, 2018. ^ Newton, David. "Panthers officially release all-time leading rusher DeAngelo Williams". ESPN. Retrieved March 14, 2015. ^ "Carolina Panthers Rushing Career Leaders". Pro-Football-Reference.com. Retrieved February 8, 2017. ^ "Game Play Finder - Pro-Football-Reference.com". Pro-Football-Reference.com. Retrieved July 4, 2017. ^ a b "Carolina Panthers Rushing Single-Season Leaders". Pro-Football-Reference.com. Retrieved November 8, 2015. ^ Orr, Conor (March 13, 2015). "Steelers ink deal with former Panthers RB DeAngelo Williams". NFL.com. National Football League. Retrieved March 13, 2015. ^ "Thursday Fantasy Fliers, Week 1: DeAngelo Williams and Danny Amendola". Retrieved July 4, 2017. ^ "NFL Fan Pass - Celebrate on the field at Super Bowl XLIX!". NFL Fan Pass. Retrieved July 4, 2017. ^ "Watch Pittsburgh Steelers vs. New England Patriots [09/10/2015] - NFL.com". www.nfl.com. Retrieved July 4, 2017. ^ "Steelers RB DeAngelo Williams rushes for three scores in win". Retrieved July 4, 2017. ^ "Barely used Sunday, DeAngelo Williams will be fresh for Ravens". Retrieved July 4, 2017. ^ Kirkendall, Jesse (October 2015). "Steelers: Why DeAngelo Williams still holds a vital role on offense". Retrieved November 8, 2015. ^ "Two Steelers fined for uniform cause shoutouts". Retrieved July 4, 2017. ^ "Cincinnati Bengals at Pittsburgh Steelers - November 1st, 2015". Pro-Football-Reference.com. Retrieved March 31, 2018. ^ "Oakland Raiders at Pittsburgh Steelers - November 8th, 2015". Pro-Football-Reference.com. Retrieved March 31, 2018. ^ "Pittsburgh Steelers at Cincinnati Bengals - December 13th, 2015". Pro-Football-Reference.com. Retrieved March 31, 2018. ^ "DeAngelo Williams 2015 Game Log". Pro-Football-Reference.com. Retrieved March 31, 2018. ^ "2015 NFL Leaders and Leaderboards". Pro-Football-Reference.com. Retrieved March 31, 2018. ^ "Le'Veon Bell's suspension reduced to three games". NFL.com. Retrieved March 19, 2019. ^ "Pittsburgh Steelers at Washington Redskins - September 12th, 2016". Pro-Football-Reference.com. Retrieved March 31, 2018. ^ "Cincinnati Bengals at Pittsburgh Steelers - September 18th, 2016". Pro-Football-Reference.com. Retrieved March 31, 2018. ^ "2016 NFL Week 1 Leaders & Scores". Pro-Football-Reference.com. Retrieved March 31, 2018. ^ "DeAngelo Williams 2016 Game Log". Pro-Football-Reference.com. Retrieved March 31, 2018. ^ "2016 Pittsburgh Steelers Statistics & Players". Pro-Football-Reference.com. Retrieved March 31, 2018. ^ "AFC Championship - Pittsburgh Steelers at New England Patriots - January 22nd, 2017". Pro-Football-Reference.com. Retrieved March 31, 2018. ^ Freeman, Mike. "DeAngelo Williams Defying Father Time in Sparking Steelers to Enviable Start". Bleacher Report. Retrieved March 19, 2019. ^ "DeAngelo Williams has retired from the NFL". Pittsburgh Steelers. Retrieved March 19, 2019. ^ "Watch: DeAngelo Williams, Browns' Barnidge team up in wrestling ring". The Score. Retrieved July 4, 2017. ^ Fiorvanti, Tim. "DeAngelo Williams set to make pro wrestling debut". ESPN.com. Retrieved July 4, 2017. 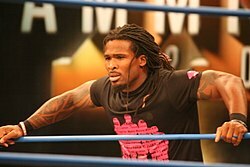 ^ "OFFICIAL PRESS RELEASE ON DEANGELO WILLIAMS ENTERING THE RING AT SLAMMIVERSARY - PWInsider.com". www.pwinsider.com. Retrieved July 4, 2017. ^ "DeAngelo Williams Makes His IMPACT Wrestling Debut at #Slamm15". Impact Wrestling. July 3, 2017. Retrieved July 4, 2017. ^ Phillips, Ryan (July 3, 2017). "WATCH: DeAngelo Williams Looked Really Good In His Pro Wrestling Debut". The Big Lead. Retrieved July 4, 2017. ^ "DeAngelo Williams will try pro wrestling while he grapples with possible NFL retirement". Washington Post. Retrieved July 4, 2017. ^ Meltzer, Dave (July 3, 2017). "WOR: New Japan in Long Beach Night Two, TNA Slammiversary". Wrestling Observer Radio. Retrieved July 3, 2017. ^ Alvarez, Bryan (July 2, 2017). "DeAngelo Williams was actually pretty damn amazing in his first-ever match". Twitter. Retrieved July 4, 2017. ^ Meltzer, Dave (November 29, 2017). "Kevin Greene would be near the top. Best ever was DeAngelo Williams..." Retrieved March 19, 2019. ^ Joseph, Andrew (July 6, 2017). "DeAngelo Williams is retiring from wrestling after narrowly avoiding serious injury in debut". USA Today. Retrieved March 19, 2019. ^ "Williams to return". Impact Wrestling. Retrieved March 19, 2019. ^ a b Kluck, Ted. "ESPN.com: Page 2 : A day with DeAngelo's family". www.espn.com. Retrieved July 4, 2017. ^ Foss, Mike. "Deangelo Williams says the Panthers ignored his mother's death". USA Today. Retrieved March 19, 2019. 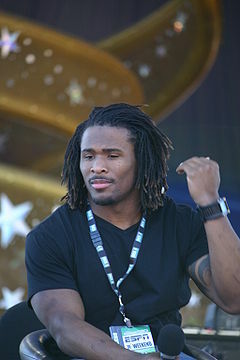 Wikimedia Commons has media related to DeAngelo Williams.